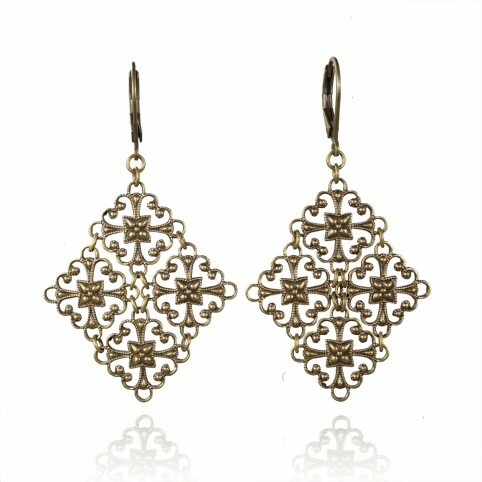 Antique brass earrings with delicate and detailed filigree pendants. 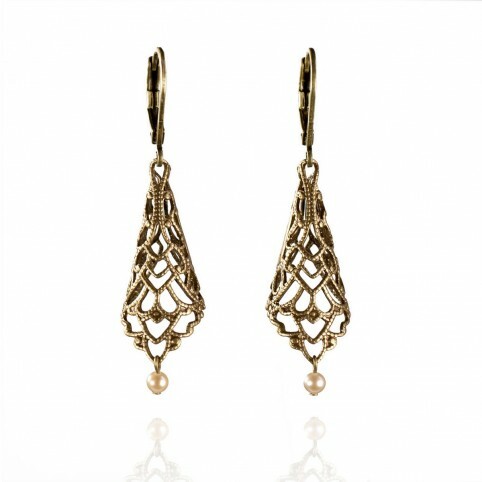 These earrings are long, but quite light though.Total height: 5,2cmWidth: 3cmMounted on leverback closures. 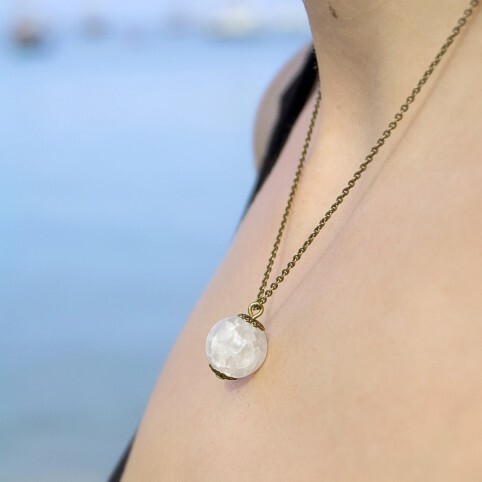 A necklace designed for mermaids. However, women with legs may wear it too. 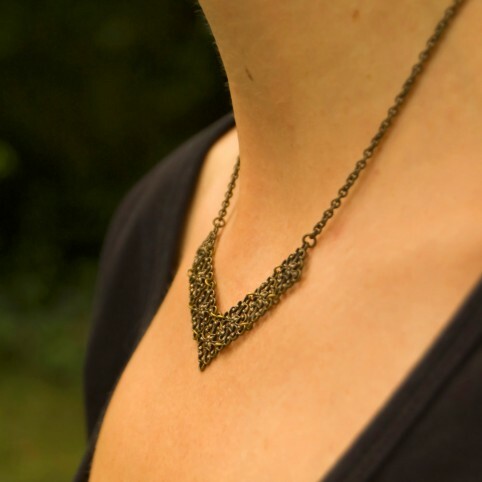 Three mesh triangles, like a crown up side down, mounted on a very thin chain. Lobster clasp. 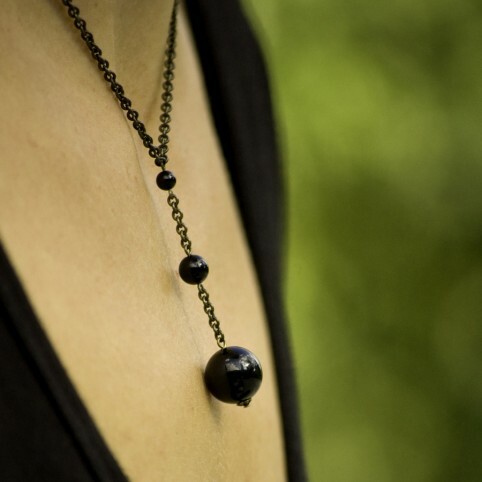 Asymmetrical necklace, with thin double chain and faceted hematite beads (semi precious stones). 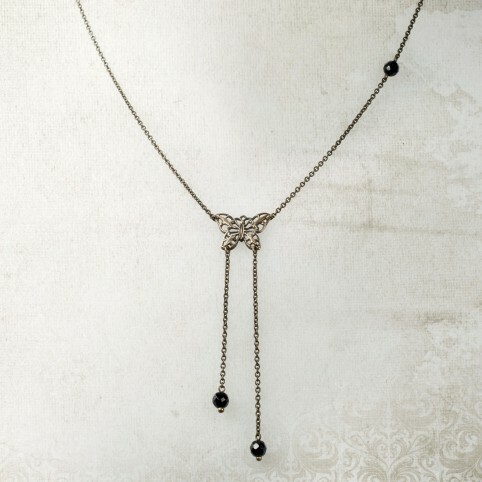 Antique brass chains and lobster clasp. 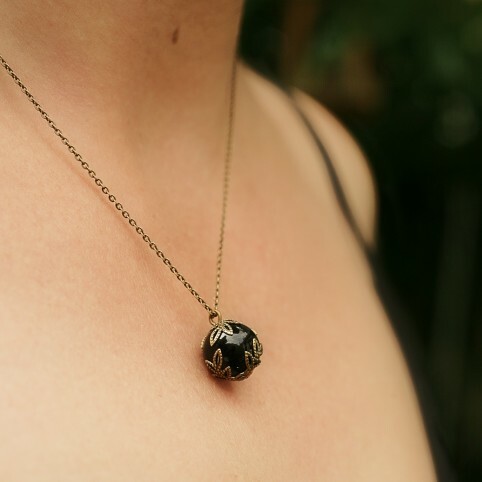 An onyx bead, set between openwork stampings. The onyx bead is about 12mm in diameter. 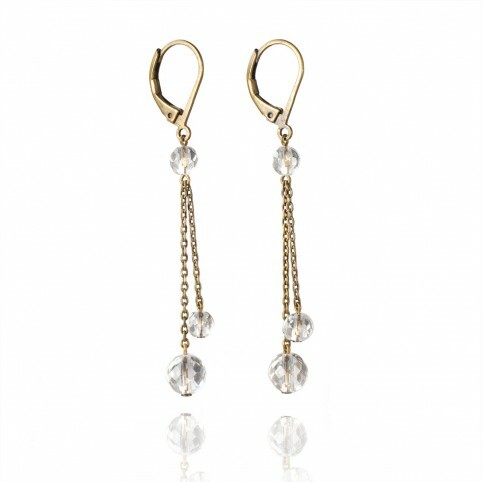 Antique brass earrings with thin chains, ended by rock crystal beads, bright and transluscent stones. 3 versions available for different light effects: crackled, frosted and faceted rock crystal beads. Mounted on leverback closures. 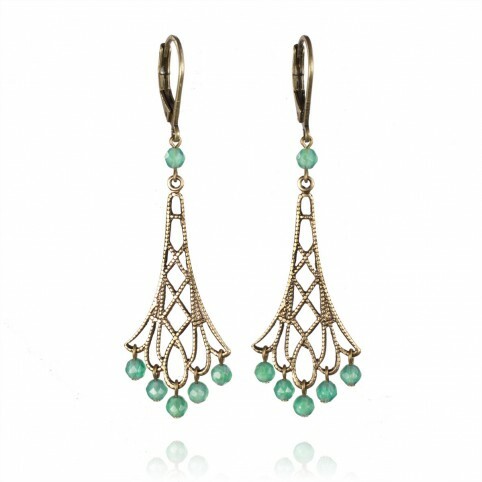 Short and discreet leverback bronze drop earrings with gemstone beads (onyx, green agate, aventurine or pink quartz). The gemstone beads measure about 8mm in diameter. Asymmetrical necklace with enamel charm, double chain on one side and semi precious stone bead. 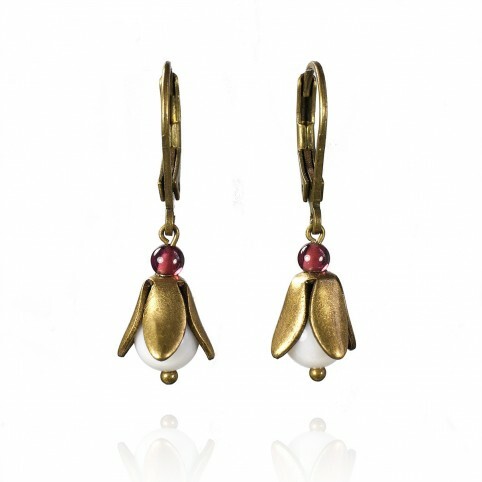 A clean and crisp design, with delicate hues. 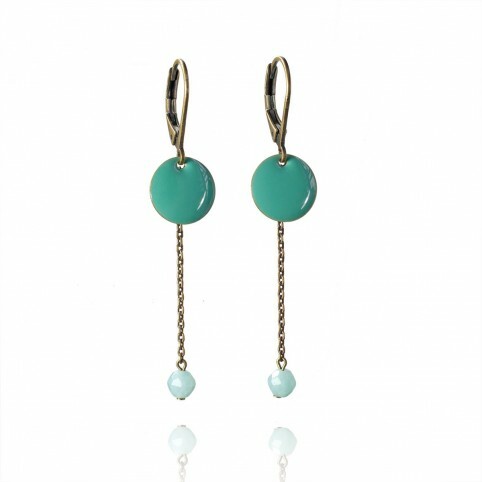 vailable in 3 versions:- Tuquoise enamel with faceted amazonite beads- Blue-grey enamel with light blue quartz beads- plum color enamel with faceted pink quartz beadsAntique brass chain and lobster clasp. Three onyx beads whose dimensions follow a very specific geometric progression. the Fibonacci sequence (Italian mathematician born in Pisa in 1175). This geometric sequence is closely related to the golden ratio. 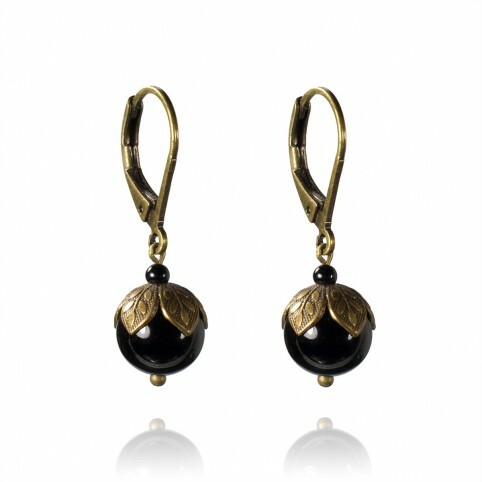 Antique brass long earrings with enamel charms and thin chains ended by semi precious stone beads. Available in 4 versions:- Tuquoise enamel with faceted amazonite beads- Blue-grey enamel with light blue quartz beads- plum color enamel with faceted pink quartz beads- Red orange entamé with cherry quartz beadsMounted on leverback closures. Y shaped necklace with thin antique brass thin chain, small butterfly openwork pendant and faceted semi precious stone beads. Available in white (white agate) and black (onyx). Lobster clasp. In French, the word "confidence" doesn't mean confidence, it means "under the rose". 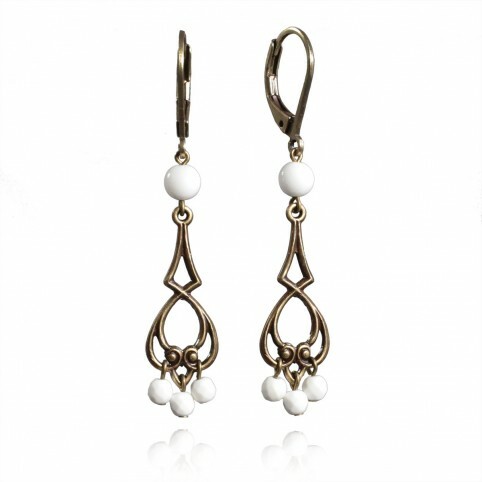 This is a white agate bead set between openwork stampings and mounted on a thin antique brass chain. The agate bead is about 12mm in diameter. 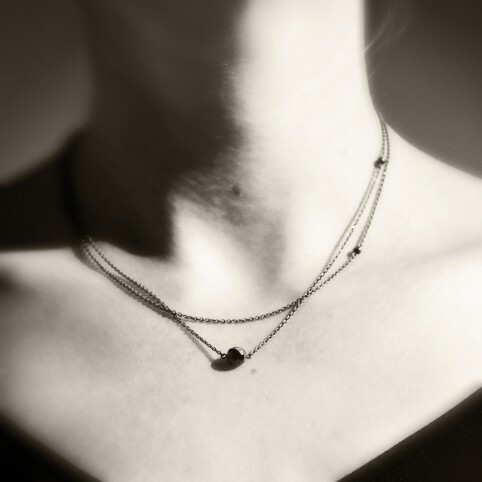 Thin chaîn and small semi precious stone beads This necklace is as simple as elegant. 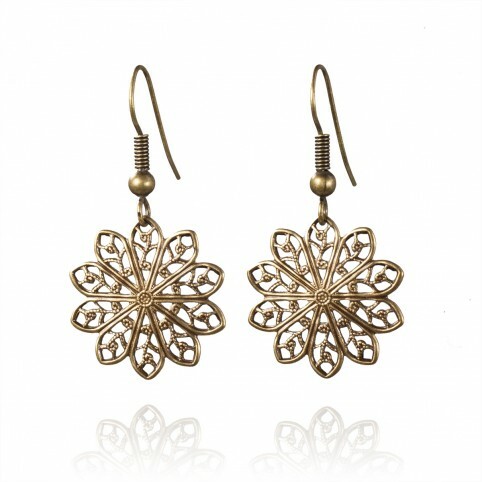 it is also very easy to wear with any outfit. 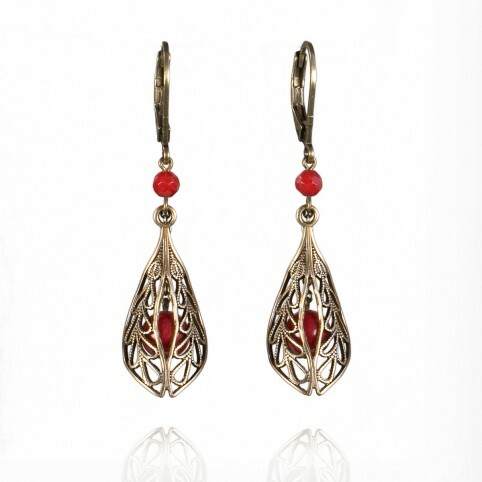 Thin brass chain and tiny semi precious stone beads. Length (including clasp): 42 cmLobster clasp. 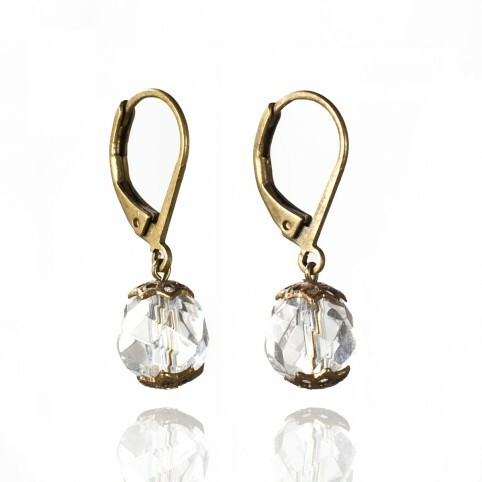 Short earrings with faceted rock crystal beads. Mounted on leverback closures. 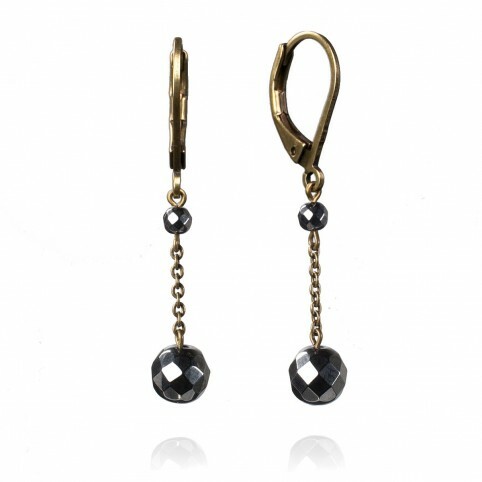 The crystal beads measure about 8mm in diameter. 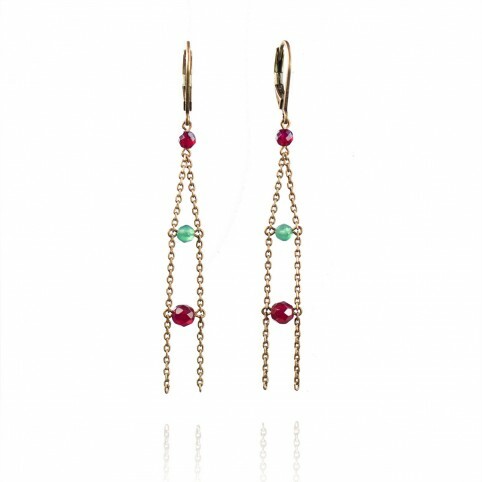 Long and light earrings, with thin antique brass chains aud small faceted dark red and light green jade stone beads. Mounted on leverback closures. 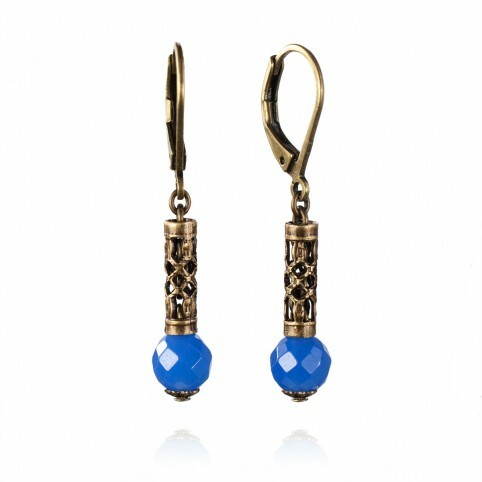 Antique brass leverback drop earrings with faceted blue agate or amazonite gemstone beads. Elegant and a little oriental. The beads measure about 6mm in diameter.Total height: 3,7 cm (including clasp). 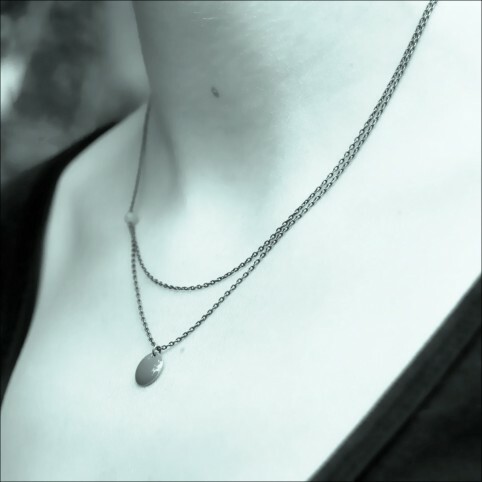 Thin antique brass chain and rock crystal bead pendant. Crackled, faceted or frosted, different light effects. The crystal bead is about 12mm in diameter. 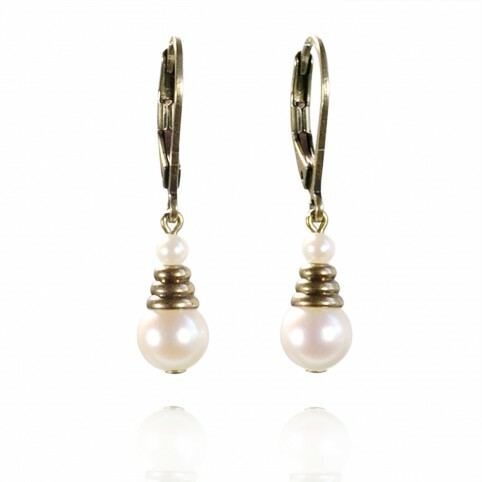 Small drop earrings with white cultured pearls and leverback closures. Tiny and bright.The pearls measure about 6mm in diameter. Sautoir parsemé de perles en camaïeu de gris : labradorites, hématites, perles de culture grises, perles de Swarovski black diamond. Fermoir crochet. 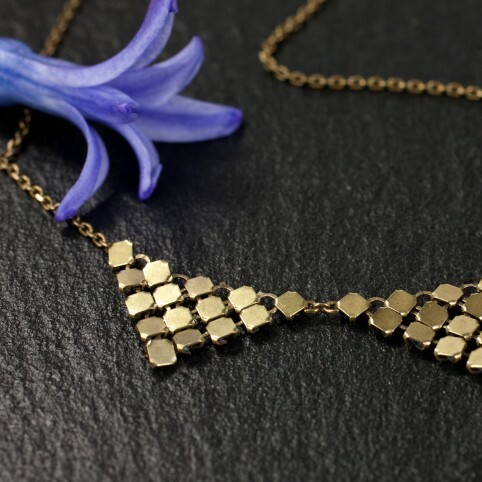 Necklace with antique brass chain and V shape pattern made of linked filigrees.Length including clasp: 43cm Hook and eye clasp. 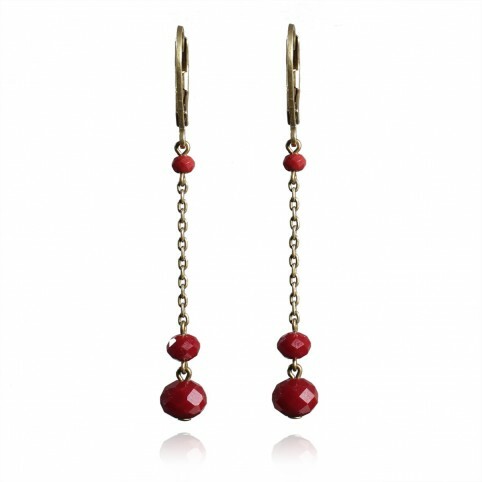 Drop earrings with thin chain and carmine red facetted glass beads. 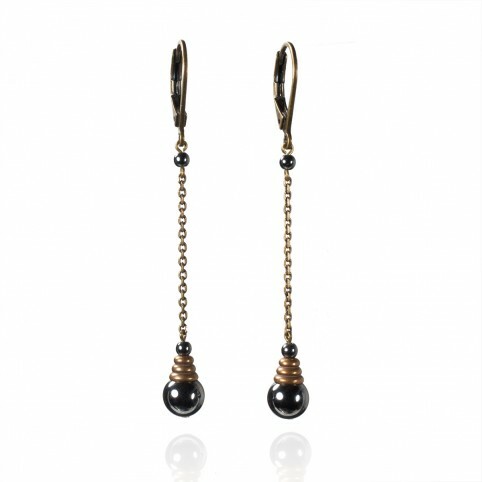 Leverback closures.Total height (including closures) : 4,8cmThe beads that end the earrings measure about 5mm in diameter.